Linda Jobe was born on December 18, 1943 to O.M. and Myrtle Wilshire in Everman, Texas. Jobe moved to Mansfield, Texas when she was three and later enrolled in the Mansfield ISD, where she graduated as valedictorian in 1962. Attending Arlington State College, now the University of Texas at Arlington, from 1962-1966, Jobe earned a Bachelor of Science Degree in mathematics. Mrs. Jobe began teaching summer school at MISD in 1966 and was on regular contract in September of the same year. While teaching, she married Kennith Jobe in June of 1969 and had a daughter, Amy Jobe in 1977. 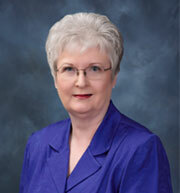 She also earned her Master of Education Degree in 1981 from Tarleton State University. With nearly 35 years of devoted service to Mansfield ISD, Jobe taught math at Mansfield High School and Mansfield Junior High, also serving as the Department Chair for Mathematics at MHS. Jobe worked as the K-12 District Math Specialist in 1988-89 and served on numerous committees for the MISD. In May of 2000, Jobe retired from a long and dedicated career to the Mansfield Independent School District.